Behold is an old-fashioned word we rarely hear these days. It's not in most modern translations of the Bible. Yet Pamela Hawkins says this word softens the edges of her heart. "I cannot say this word without moving, without extending and lifting a hand, palm open, toward the object of my attention," she remarks. 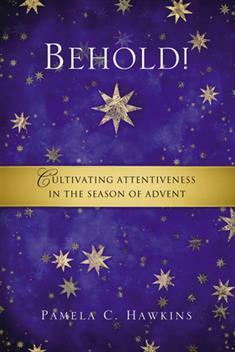 Enter Advent this year with an attitude of curious expectancy and trustful anticipation. Linger for a while and pay close attention to the meaning of the season as you focus on a single word each week, pray the beautiful prayers and hymn texts, and try various forms of prayer. Behold the Word with new eyes, new ears, a new heart, and a sense of new possibilities. Let Pam Hawkins encourage and help you behold the "news of great joy," Christ the Lord, who is coming to make all things new!